Having braved the traffic a few times relying on the trafficators to signal my intention to turn at a junction, nearly coming a cropper on more than one occasion, I just knew I had to add indicators to my Box saloon. However, I didn’t want to disconnect the trafficators – I wanted to have both. Also, if they’re going to be any use in bright sunlight, they’ll need some sensible wattage bulbs. I’d done some homework and it is clear that the standard fuse rating simply isn’t up to driving trafficators plus flashers. It may last for a while, but that fuse won’t take the strain for long. The reason is that the old calculation for current (amperage) for a light bulb simply isn’t true when the bulb is first switched on. A 6V 12W bulb draws 2Amps ONLY WHEN IT HAS REACHED FULL BRIGHTNESS. A “cold” bulb takes two to three times more current than when it has come up to full brightness. Not a problem normally, but a flasher bulb is switched on between 60 and 120 times every minute. Here’s my solution, which also allowed me to add a hazard light switch. Not strictly necessary, but having suffered the odd temporary malfunction, (never a breakdown!). This can be added for next-to no extra trouble. The circuit is shown in the diagram. Basically, I’ve added two changeover relay, (double pole double throw to be strictly accurate), the coils of which are driven one from each trafficator. These make a separate connection to a flasher, allowing it to have it’s own fuse. I’ve taken the supply straight from the top of the starter motor, (plenty of amps there! 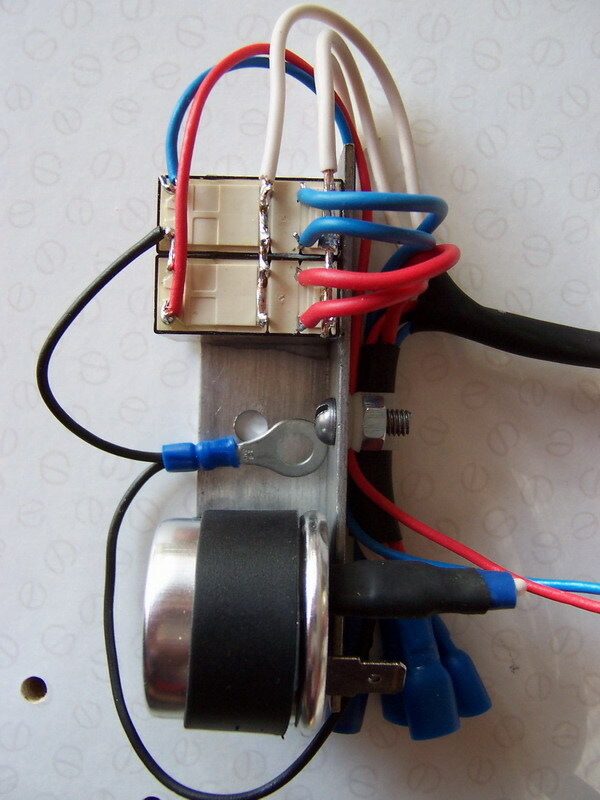 ), with a separate 15A fuse. How it works: when power is applied to the trafficators, either the left or right relay will close. When that happens, power flows through the new fuse, via the flasher, down through the relay and finally to the bulb. I’ve used a separate contact for each bulb, because of the high starting current. That way I won’t burn the contacts and they’ll last much longer. I’ve connected the “normally open” contacts to the flasher and the middle moving contacts to the bulbs. This means that when the trafficators are off, the bulbs are automatically connected to a second set of contacts - the “normally closed” set. By shorting out the “normally open” set to the “normally closed” set, all four bulbs are now connected to the flasher – hazard lights! It would be easy to let this become electric spaghetti, but I got round that by making up a little relay bar using a scrap of aluminium angle and some superglue. Wiring can then be done on the kitchen table! 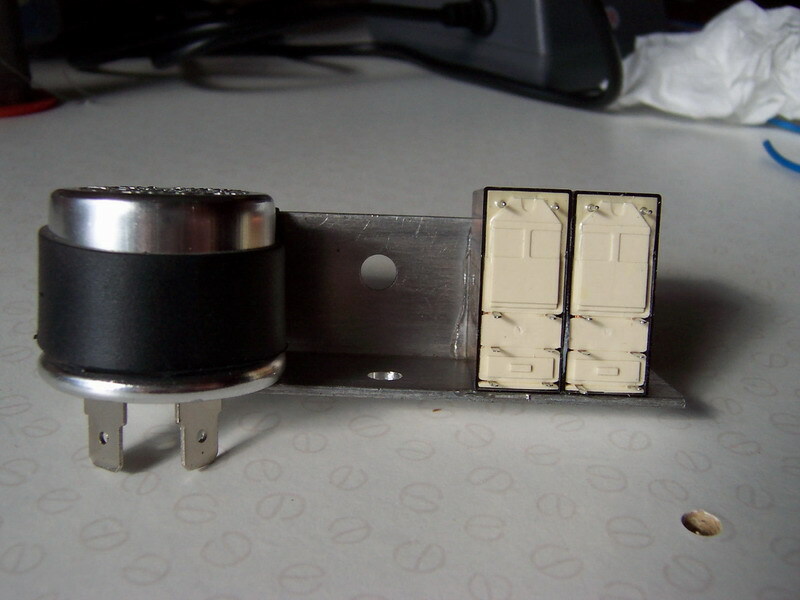 Not wanting to get into the 6V vs 12V debate – I’ve included the part numbers for both types of relay – you pays your money and you takes your choice! This article, written by Geoff Hardman, originally appeared in CA7C Seven Focus in Apr 2005 pp13-15.